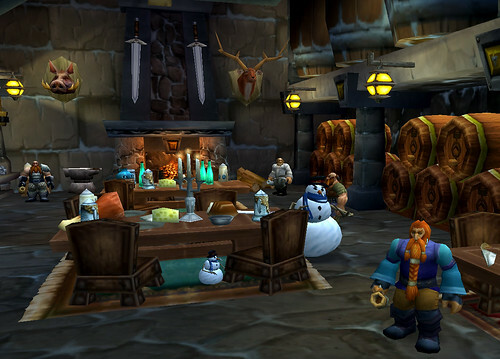 I had to search around a bit to find a harvest feast in World of Warcraft somewhat suitable for the American Thanksgiving holiday. For the non-Americans in the audience, tomorrow is what retail people call Black Friday, because it’s the day when every American is required to go shopping ALL DAY. I’m not in retail, but I do promise to be part of the problem. I’ll be in that traffic. I’ll stand in line. I might shove a little, but I’ll look innocent and gesture to the guy behind me. I’ll act impatient. I won’t know what I want to buy until I monopolize a salesperson’s time for an hour or more. I’ll want delivery on Friday. I won’t take out my credit card until after the cashier has rung up the sale. “What? I have to pay for this? I assumed a handshake would be sufficient.” And before it’s all over, I will have transferred a significant portion of my wealth back into the American economy. That’s how I give thanks. Have a good holiday, back next week. I don’t write about gear alot because it’s not really my deal. The hardware section is not my first choice when doing a thorough browse of my local Best Buy. Not that you asked, but I’ll usually start off in the console games section, moving off into cellphones and iPod accessories, then a slow stroll past the camera equipment to reach the Wall of DVDs, followed by a careful scrutiny of CDs … must. resist. the. siren’s. song. of the boxed sets … into computer hardware and PC games, with the big finish in Plasma Televisions. The brief layover in hardware is mostly for my mental list of stuff to search for on Newegg.com. Like this recent acquisition … the Logitech G15 keyboard. Put plainly, this is the BEST KEYBOARD I HAVE EVER OWNED. And I’m like you, I use up keyboards almost as fast as mice (mouses? ), so when a keyboard dies, I’ll race to Best Buy and tell Skippy to get me cheap, wired, in stock STAT!! Guild Raid!! No time to chat! Problem #1: I do not own an Xbox 360. Problem #2: I do not own Gears of War. Problem #3: I am not made of money. I’ll drop half a mortgage on a plasma television that I’ll watch on Sundays, but $400 for one game? I’m balking. How good could this game be? As I’m researching how much this non-MMORPG adventure would set me back, I browsed past all the Xbox 360 faceplate mods I could buy — I don’t want my Xbox to look like a Chrysler Town & Country, thankyouverymuch — until I spotted this: Pelican’s Design Your Own Faceplate. I did not even know such a thing was possible. This really appeals to my basest of consumer instincts — now I want the Xbox just so I can have the $30 unique-to-me faceplate. Or, how bout I turn the tables on that. I’m willing to sell space on my new Xbox faceplate for say … $200. When my neighbors and close friends come over to my home to watch me play Gears of War, your company has a captive audience for your marketing message. That’s value! I’m serving the drinks, I’ll open the Doritos bags, I’m going halfsey on the Xbox + Gears of War, you’re getting prime marketing real estate in my HOME. Non-motor oil advertisements are welcome as well.